This fascinating chart was published by Chart of the Day on Friday morning. Note lower channel levels, an area that seems inevitable before this bear market is finally over. For some long-term perspective, today's chart illustrates the Dow adjusted for inflation since 1925. There are several points of interest. For one, the inflation-adjusted Dow has gained a mere 55% since its 1929 peak and gained only 10% since its 1966 peak – not that impressive considering it took many decades to achieve those gains. It is also interesting to note that based on an inflation-adjusted Dow, the current bear market actually began in 1999 only to be interrupted briefly by a multi-trillion dollar credit bubble. That bubble has burst, of course, and the Dow now trades at a level not seen since 1995. 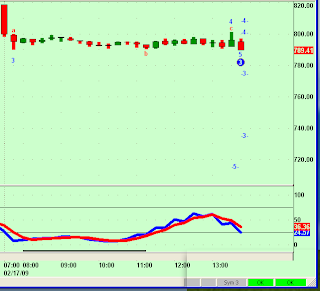 This is my 60 minute DJIA chart. Two channels are drawn, the long channel is the entire five wave decline in progress and the shorter channel is the small wave 4 that seems to be temporarily in control. We all know what should come next. 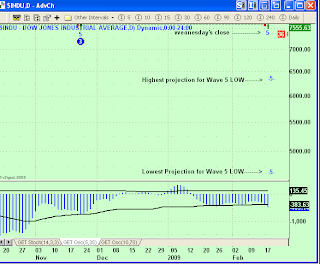 The end of the wave 4 consolidation and a no-mistake-about-it wave 5 decline. If anyone saw Bob Prechter today on Bloomberg, you know he has turned negative on Gold. 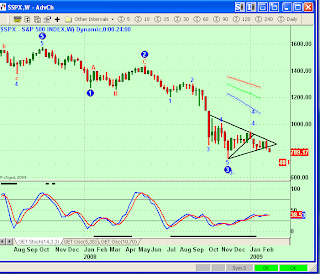 This view is confirmed by my Cycles and EW charts below. There are two liquid ETF's that are useful for trading Bonds, TLT for being long bonds (short interest rates) and TBT for being short bonds (long interest rates). Below are my cycle and EW charts for TBT, suggesting bonds are heading lower in price and yields are headed higher. I now like to trade Oil with USO, an ETF tied to the price of Oil and not to the price of a basket of oil stocks (as are DIG and DUG). 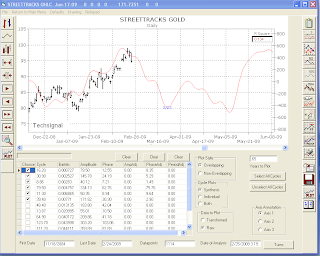 Two different time frames, multiple time frames offer additional dimensions of information that contribute perspective to the analysis at hand. 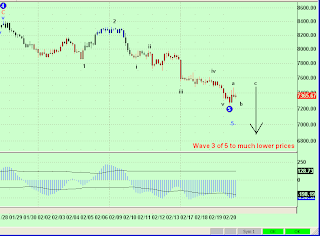 In this case, the Daily chart shows five waves down in a completed wave 3 and now targets a wave 4 between 40-45. 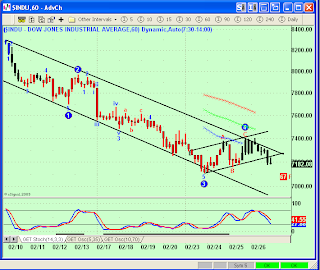 Also, please note the fresh BUY signal on the Blue Wave trend chart. The 120 minute chart on top of the Daily chart is showing the move up in Wave 4 already in progress, initially targeting the low 30's. 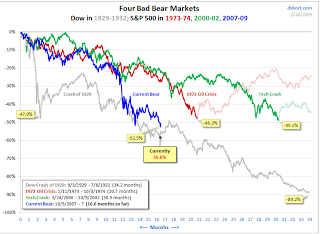 The current bear market, now 16 1/2 months old, continues to dominate our saga of the Four Bad Bears. The accompanying chart is intended not as a forecast but rather as a way to study the current decline in relation to three familiar bears from history. Bob will appear on Bloomberg television for an interview with Pimm Fox in the 5 p.m. hour (Eastern Time) today, February 25. Visit Bloomberg Television - to see if it's available in your area. Bob will appear on Business News Network for an interview around 5:20 (Eastern Time) Thursday, February 26. The video will be available on their website a couple of hours after the interview. Bob will appear on CNBC for an interview around 4:15 (Eastern Time) Friday, February 27. Looks like Wave 4 has ended, but a rally back to today's open and/or highs would suggest that this decline is only a B wave and any subsequent rally is a C wave. Either case suggests new lows for this entire leg down are expected. Doesn't it seem that there is always just one more Wave 5 to go? These charts are screaming, "Yes we can," to another Wave 5 decline at the doorstep. Here are my charts, which should be read in light of the Volatility Cycles post. 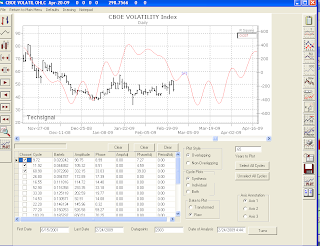 VIX is the ticker symbol for the Chicago Board Options Exchange Volatility Index, a popular measure of the implied volatility of S&P 500 index options. A high value corresponds to a more volatile market and therefore more costly options, which can be used to defray risk from volatility. If investors see high risks of a change in prices, they require a greater premium to insure against such a change by selling options. Often referred to as the fear index, it represents one measure of the market's expectation of volatility over the next 30 day period. One characteristic of market volatility is that stock prices usually move opposite volatility. When stock prices rally, volatility drops, when stock prices fall, volatility rises. Forecast one, forecast both. 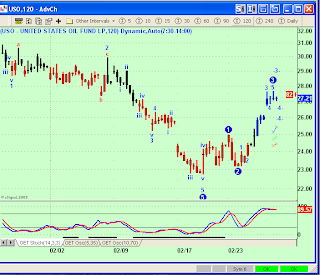 The EW chart shows the VIX completing five waves up yesterday and today, what appears to be an "A" wave down. 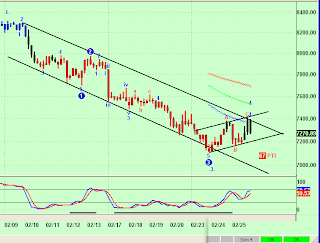 This should be followed by a "B" wave back up near the the prior Fifth Wave high. 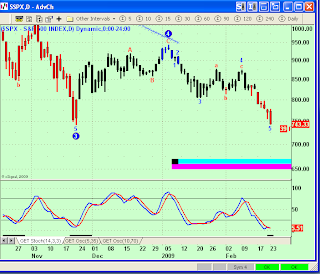 The suggestion is that stock prices will now fall while VIX rises in a "B" Wave. 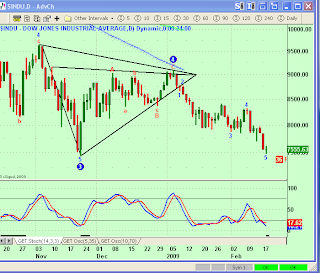 Any help from the left side, the Trend chart? Sure. Every sharp drop in volatility (like today) is usually followed by a sharp rise in volatility (tomorrow?). 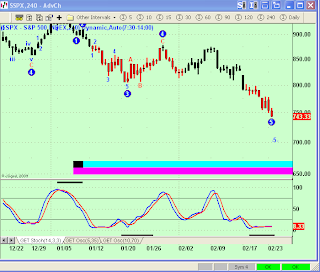 Today's drop in VIX coincides with a cycle low. The chart is forecasting that VIX will now rise into March 3rd, suggesting the inverse for equity prices, a drop into March 3rd. This is exactly what the EW and Trend analysis charts are forecasting, i.e. a rise in VIX and a fall in stock prices. The above Cycles chart of SPY is showing both a small blip up which would account for today's action, and then lower into the first few days of March, thus confirming the VIX analysis. Well, that is the question before us tonight. 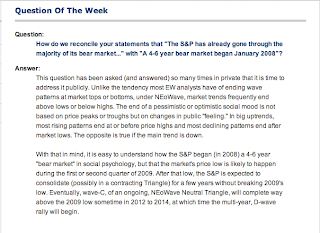 How much further will this leg of the bear market decline, or is there something more gruesome lurking out there? Bob Prechter closed his July, 2007 Short (up an astonishing 800 S&P points!) at today's close, saying in relevant part that things are short-term oversold, but that the next decline will be so precipitous that holding appreciating shorts carries the risk of underlying institutions defaulting on paying off those shorts. Scary stuff. Above is the Weekly S&P chart. On it is placed a horizontal blue bar with two vertical black bars and the numbers 650-670 along side. That is where my EW software is suggesting the next level of market support lays. The vertical black bars are the weeks most likely to achieve that level. 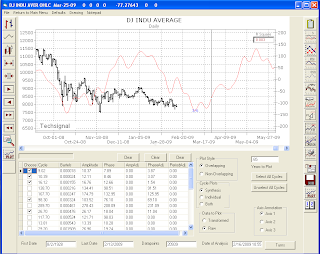 The same tool drawn on the Daily chart gives similar levels for this part of the decline. Another 100 or so S&P points. The above Sixty minute chart is the most bearish of the EW charts, suggesting we are in the midst of a 3rd Wave decline that seems to be targeting a minimum of 100 more S&P point decline, maybe much, much more. It is this chart that lends credence to fears that something nasty is about to befall Global markets, a no-place-to-hide financial disaster. The implication of this chart is that a cycle low is due the first week of March, followed by a one-week rally. The one scenario that might satisfy all of this speculation is for a significant low to be put in place in the next couple of weeks, followed by a substantial rally. How low and how much of a rally? Retain that dear perfection which he owes. Be there any doubt that the tide has changed? Fifteen years of prices paint a clear and unambiguous map of where we have come from and where we are going. Simplicity has its virtues. To cease thy strife, and leave me to my grief. 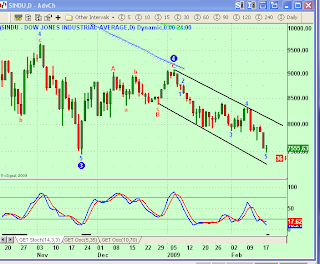 A completed fifth wave decline? That's what the above chart is suggesting could be happening, but the charts below argue that more grief lays ahead. 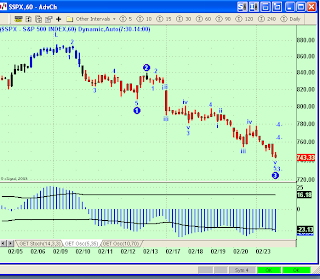 On the above chart, check out the oscillator on the bottom of the chart. Looks to me like it hasn't bottomed out yet, meaning lower prices still to come. The beauty and magic of two star-crossed lovers. 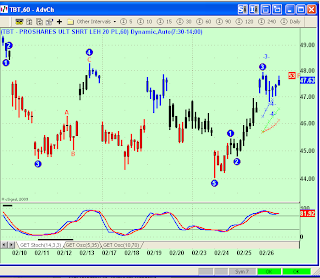 On the right is the same wave count as on the single chart above, on the left is the same wave count again, this time superimposed on the Blue Wave indicators. To keep things understandable for all, let's just look at the single main Blue Wave indicator, capitalized ("Capulet?") as Red and Blue bars, Red for Bearish-Bias and Blue for Bullish Bias. On the left Blue Wave Chart, see how well the colored bars coincide with my tentative wave counts. Each impulse wave lower is signified with an almost perfect correlation with the red bars the counter-trend rallies that are tradable show up as blue bars. Finally, note that the last two sixty minute bars are colored blue, this was Friday's mysterious 200 point rally just before the last hour of trading. Sheer manipulation, or the beginning of a counter-trend A-B-C rally as a second wave, just prior to a powerful third wave decline? 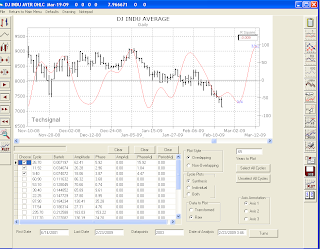 Two very excellent tools, working together to guide the trader throughout the days and weeks of market ups and downs. Find something that works, then use it. I keep thinking that this journey we are on is going to turn on us one of these days and prove all the Pollyanna bulls are right, that stocks are cheap, that markets always return to the long term upwards slope of the mean and that there is something just plain un-American about forecasting a continuing bearish trend. This market tested my faith Thursday morning when it gapped up and put my substantial short position in jeopardy. But I looked at my charts, my indicators, the patterns and wave counts we have been following for the past six months and said to myself, "Buy more puts." Which I did. FIND SOMETHING THAT WORKS AND USE IT! First out of the gate tonight is a Daily chart of the DJIA. I like this chart because it shows clearly where the market is coming from year-to-date and it incorporates a three-dimensional triangle (well, use your imagination for that third dimension) that has been decisively broken. The above Daily chart shows that the entire year of 2009 has seen a descent out of a big wave 4 triangle ending the counter-trend rally from last November's lows. Before moving on to our next chart, look at how well the FBS oscillator captured the decline with a Sell signal the first week of January. Same Daily chart of the DOW, this time with a downward sloping channel superimposed on prices. Again, look at the Daily FBS and see the horizontal black line that is just now appearing on the screen. This is signifying a down-trend in progress. Since the February 13th Sell signal, the BWT trend has remained steadfastly bearish even in light of the past couple of days of whipsaws and stop-running. None of that fooled the BWT trend, signified by the red 30 minute candlesticks. This is why when you find something that works, you buy it and use it in your trading. Blue Wave is worth the price, but if you tell Randy (BW Developer) that "Allan sent me," maybe he will discount the program. (Sorry, Randy, if you're reading). So, where are prices going from here? 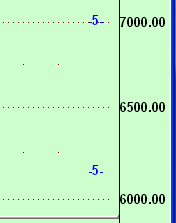 Yes, that's somewhere between 4500 and 6400 on the DJIA. How accurate is this program? Very. But it's not perfect, especially when it comes to Fibonacci based projections. Nonetheless, we don't seek perfection in trading, we seek probabilities and every chart above, every technique used on every chart above and every word of this blog is designed to exploit the probable and when all is said and done, these probabilities are screaming, "Down, down, down." It was a work of art. Chop, chop, chop, gone. Three chops just before the close before a three day weekend and with everyone and their brother stopped out and gone for the day, they initiate Wave 3 Down with no one left short, except them of course. If Tuesday's gap leaves any room to get on board, there should be plenty of downside remaining for those left with mouths wide open at today's close. 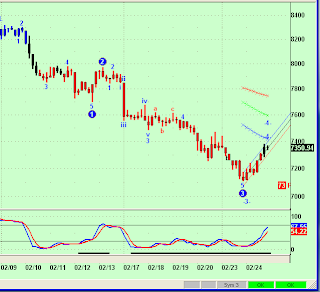 My Advanced GET software is projecting a decline to under 720, just based on today's mostly sideways action. Once this decline starts in earnest, expect even lower projections. Some of my best ideas for blogs and such, come from a little night music. Such was the case last night, with a haunting rendition from a Broadway play by the same name. You have to read this blog to get there. A number of fascinating aspects to this chart, going back all the way to the early 90's. First, the False Bar Stochastic (available only on Advanced GET software) was suggesting that the proper position of the decade of 1990-2000 was to Hold Long. The long horizontal black line above the stochastic oscillator is confirmation of a decade long bullish trend. If we follow the oscillator into the Wave 4 that begins at the 2000 Top, it provides an excellent re-entry Long signal with a double bottom in 2002-3. The most significant aspect of this chart is the change-in-trend that occurs in the fall of 2007. From this top, a five-wave decline is in progress and as of today, Presidents Day 2009, it appears that there is a heck of a long way to go before this five wave decline is complete. 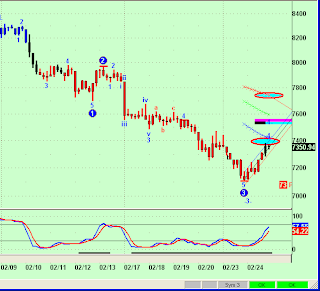 Just the third wave is targeted to complete somewhere under 6,000 on the DJIA. 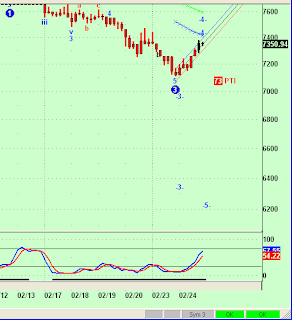 The projected end of this Wave 5 low is between 6800 - 7400. The horizontal black line on the bottom of the right chart is acknowledging a down trend already in force. The left chart, which I have been publishing for the past couple of weeks and still haven't gotten around to describing it, comes from software developed by Blue Wave Trading. Suffice it to say that the indicators on the left chart will always, ALWAYS, keep you one the right side of whatever trend is dominant in the underlying prices. In summary, news notwithstanding, the markets are in an unfinished downtrend. I'm not a big fan of using the same indicators as everyone else and expecting to see something distinguishable from the crowd. The reason I like the FBS Stochastic is that very few traders other then institutions have access to this indicator. The same theory holds for the Blue Wave charts, these are expensive programs, usually out the the range of weekend warriors who dabble in technical analysis. Yet, price should never be a factor if you find something that works, as you can usually make the cost of the tool back on a single good trade. The hardest part is finding tools that work. Except I have already done some of that for you. If I write about it, or if it is allowed to advertise on my blog (with the sole exception Google click-ads over which I have no control over content) you can be assured it is earning it's keep in my arsenal of advantages. Since the first of the year, the market is down 11.50%. NNVC is down 8.75%. While we are waiting for this ship to come in, it is outpacing the market by about 25%. This remains my best pick of 2009 and I'll say it again, I'm holding this stock until it goes to zero or goes to over $200 a share, whichever comes first. Obviously, I am pretty certain it will be the ladder. WEST HAVEN, Conn.--(BUSINESS WIRE)--NanoViricides, Inc. (OTC BB: NNVC.OB) (the "Company"), reported today that on-going negotiations with a large pharmaceutical company have now progressed to an advanced stage. The market cap of NanoViricides is currently $89.7M. Based just on what I know and believe about the company, about 2/3 of which I've posted in prior blogs, I'm suggesting that decimal point should be shifted over to the right one place. As news flows about their progress in the coming year, that decimal point will shift even further to the right. This is one of those stock stories you will tell to your grandchildren, or use to pick up girls in bars, whichever comes first. Do I still like this stock? Are the Detroit Red Wings the current Stanley Cup Champions of the world? To the right and above my photo is a new insignia, The Foundation for the Study of Cycles. Anyone interested in furthering their study in this fascinating area is encouraged to click on the insignia whereby you will be linked to a special section of the Foundation where you can access free membership and significant discounts on Foundation materials. By way of introduction to their work, I will be writing a series of articles, starting with the one below. This foundation has been around since the early 1940’s and has measured the cyclic components, with a high degree of accuracy, across such a broad spectrum of data inputs they are too numerous to mention here. But they include sunspot activity, crop growth rates, even predictions of the number of US Soldiers that would perish in any given month in the present wars in the Middle East. Of course, they also predict more pragmatic things such as securities price movements which is highly relevant to this audience. On the recommendation of my long time trading partner, Professor John Kercheval, the two of us are presently evaluating their systems with regard to securities trading. 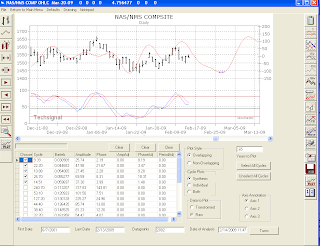 His preliminary testing indicates that there may be a variety of productive ways to incorporate these programs into one’s trading regimen and that that may differ from trader to trader. In any event, I just got my copy last night and John and I will spend the next month or so testing the systems, independently, then comparing notes and, post a follow-on post as to how we are using them and how we think they can be used by others. 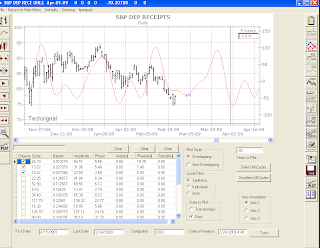 Note how well the market has been tracking the dominate cycles detected by the analytic cycle software (available at the Foundation by clicking the insignia). 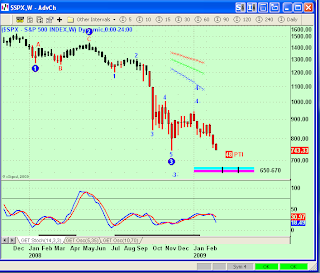 As you can see, the projected plot for the next two weeks is in concert with my EW analysis for a Wave 5 decline. For those of you interested in buying the programs or just learning more about the prevalence of cycles through your everyday life please click on the Foundation's insignia above my photo. The link will also take you to the Foundation's main site, filled with fascinating and provocative cycle studies, software, projections and articles. It's a snapshot of my 30 minute chart that highlights a few key indicators. First, the upward sloping channel up from Thursday's low prices through today's highs has been breached to the downside. 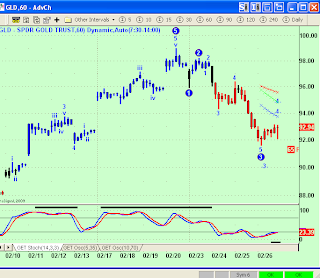 Second, the False Bar Stochastic has turned down from Overbought. 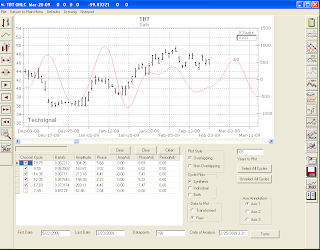 Finally, my bias trend system (left chart) flipped from Long to Short early this morning. 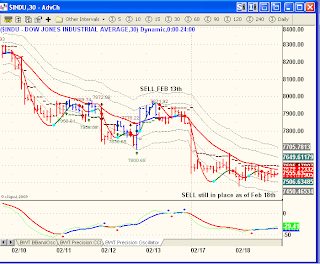 This chart is targeting 76 for this move, approximately 7600 on the DJIA. I own the February 80 puts, currently at 2.25 and will have intrinsic value of 4.00 if DIA drops to 76 anytime before expiration on February 20th. I'll be out way before then.